What Do I Use to Cut a Circle? The question-how to cut porcelain tile around the toilet flange? also comes with the question- what do I use to cut a circle? I know that it can be frustrating trying to make a cut around the toilet flange. You might not even have the proper tools to do this. There really is an easy way to do this and the tool we need to use is an angle grinder. 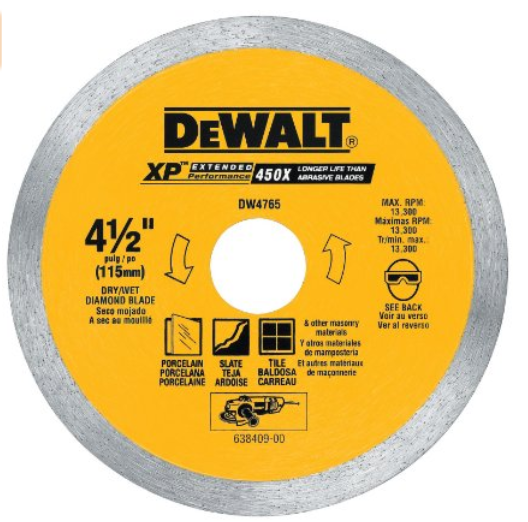 We will also need a 4 1/2 inch diamond blade that needs to be installed on the angle grinder. This might sound expensive and even difficult to track down such a thing, but it’s not! Here in Minnesota there are several different tool stores that sell tools cheap. They can also sell cheap tools. There is a difference. I have shopped at a place called Harbor Freight Tools to test out some of their tools. I put to test a heat gun and an angle grinder recently. I used both at work and for the cost of these tools I think it was a bargain but I did burn them out. I believe that for someone who isn’t going to use these tools everyday, most of them will work just fine. I just looked online and I seen one selling for $15.00. I don’t want you to go cheap on the diamond blade. 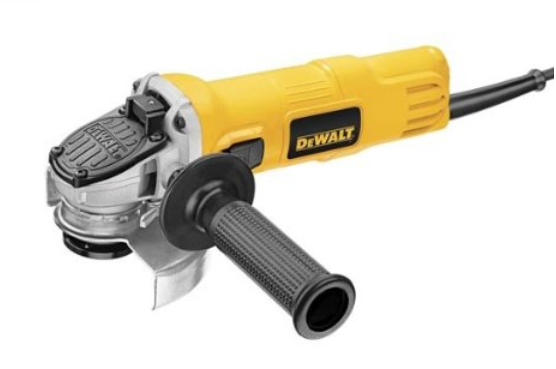 I highly recommend using this blade made by DeWalt. (Diamond Cutting Wheel) Now I recommend this blade because it’s what I use everyday. It has worked well for me on all tile. It also works great when cutting porcelain tile. I will only recommend tools I have tried and tested. I bring this up because it really works well with marking your tile correctly the first time and it takes out any guess work. Check out my Guide How to Layout Floor tile the Easy Way In Tile University. I will show you how I design a tile layout with a grid. Using this method will make your tile installation go so much easier. The easiest way I know how to explain how to mark the tile is to show you, so here you go. Now that you have seen how easy it is to mark the flange on the tile, let’s move on and talk about cutting the tile. I just want to really beat this next statement with stick. You Must Be Gentle With the Angle Grinder! If you try to force the grinder to cut the tile, the tile will BREAK every time! Try to take light, even passes and all will be fine. If do break a tile, that’s okay, I do it too. Check out this video on how to cut porcelain tile using an angle grinder. I use an angle grinder quite a bit. Whenever I have L shaped cuts, vents, outlets and many other cuts like this. If you are really trying to get by cheap, you could use an angle grinder to cut everything. I do recommend not doing that, but you could. However, I think that anyone who is installing tile needs to have this in their tool arsenal. It really comes in handy. If you are looking for more tips on how to cut porcelain tile and tiling in general, check out my blog . For exclusive tips and guides, sign up for the Project Planner. The form is in the side bar to your right. Not sure if my message got to you. Do I need to install the cement board over a plywood subfloor in the bathroom before I tile? Will this raise the floor level? Also, cant seem to figure out where to start the tiles…Bathroom is 9 X 7 with a L shape on one end. Picture a long rectangle with a box about 2 x 3 on the end. How would I calculate where to lay the first tile? Not the best at home remodeling but no money to hire a pro..so doing the best I can to make the wife like it. Thanks…great videos to help guys like me. Yes you need to use cement board over the plywood. The height will be raised, but if that is a concern you could use 1/4 cement board. I have videos that walk you through the entire process of the tile installation. This includes the layout. They are located in Tile University. It does have a membership fee, but well worth the cost!! Joe, very helpful technique and excellent video demonstration! This was my first time cutting/laying tile – watched your video examples around the toilet flange – mine was on 18 inch tile right in the corner. First cut cracked the tile, but made it on second cut- had to make small incisions on 2 sides to relieve pressure… putting the paper over flange and creasing it was the PERFECT trick – THANKS AGAIN ! Thanks Steve! I”m happy to help.